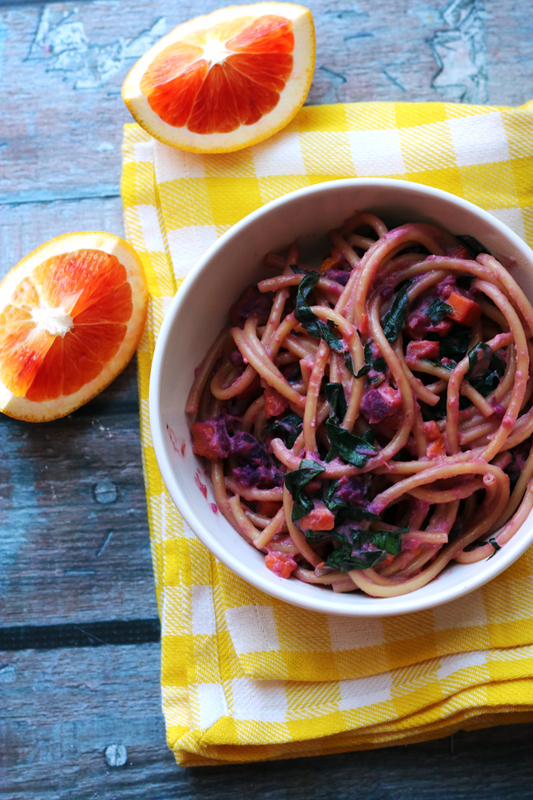 Orange and purple sweet potatoes are sauteed with garlicky swiss chard, tossed with thick and chewy bucatini noodles and then drenched in a creamy blood orange goat cheese sauce. There is a carb on carb situation going on here and I’m not even sorry about it. Mainly because sweet potatoes are so nutrient-dense that in my mind I don’t even count them as a carbohydrate! THEY ARE A VEGETABLE. End of story. Besides, if I were super strict about how and when I allowed my food groups to cohort then I wouldn’t have dinners like this in my life. And that would just be too sad. In so many ways, this dish is a sayonara to winter while simultaneously welcoming spring. 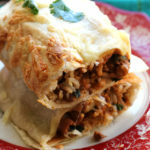 It’s hearty enough to help bolster us through these next few days (weeks??) of 30 degree weather, with the bright blood orange goat cheese sauce and scattered flecks of garlicky swiss chard there to remind us that something better is to come if we can just wait for it. 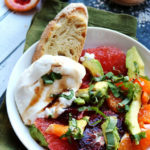 The addition of purple sweet potatoes on top of their orange counterparts help to add a little something extra, both in terms of nutrition (the anthocyanins that make it purple are powerful antioxidants) as well as aesthetic. I don’t know about you, but that magenta sauce makes me a little weak in the knees in the best possible way. The creamy goat cheese clings to the bucatini, infusing itself into every bite, and is accented by the subtle and delicate flavor of Pompeian Smooth Extra Virgin Olive Oil. This particular blend is very low in acidity due to the fact that it is made from the first cold pressing of the olives, making it perfect for incorporating into sauces where it is meant to act in a supporting role rather than lead. 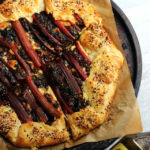 This recipe is the first in a series of FIVE that I’ll bringing to you in collaboration with Pompeian as part of their #TrendingInTheKitchen campaign! 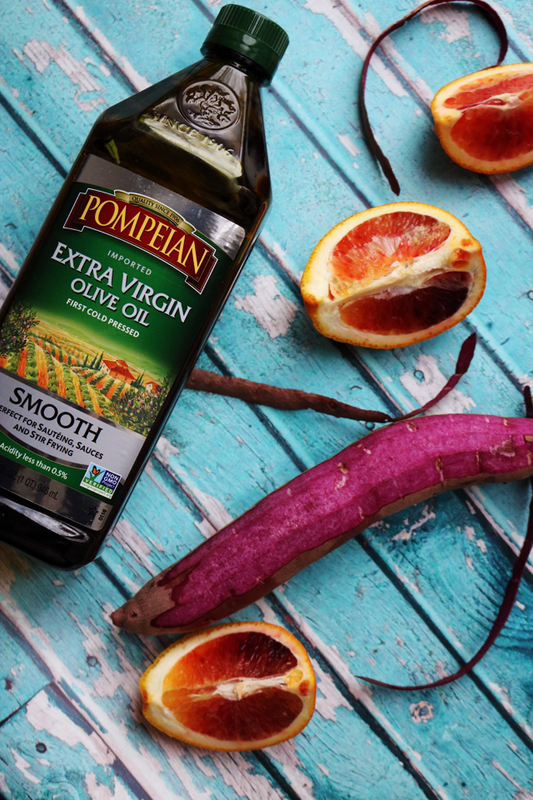 Basically we’ll be working together to provide you with recipe ideas for how you can incorporate Pompeian’s awesome oils, vinegars, and cooking sprays into some of the year’s best and most exciting food trends – like the use of purple sweet potatoes here. Prepare yourself because I have a lot of really delicious ideas that are soon to be headed your way! Heat a large pot of salted water on the stovetop over high heat. Bring to a boil and cook pasta in the water to desired consistency, according to package directions. Reserve ½ cup of hot water, drain and set aside. Meanwhile, in a large rimmed skillet, heat the olive oil over medium-high heat. Add the sweet potato cubes to the pan along with a pinch of salt and black pepper. Saute until tender, about 10 minutes. Add the chard leaves and garlic to the pan. Saute for another 5-6 minutes, or until chard is wilted and garlic is fragrant. Season to taste with salt and black pepper. Remove from the heat. 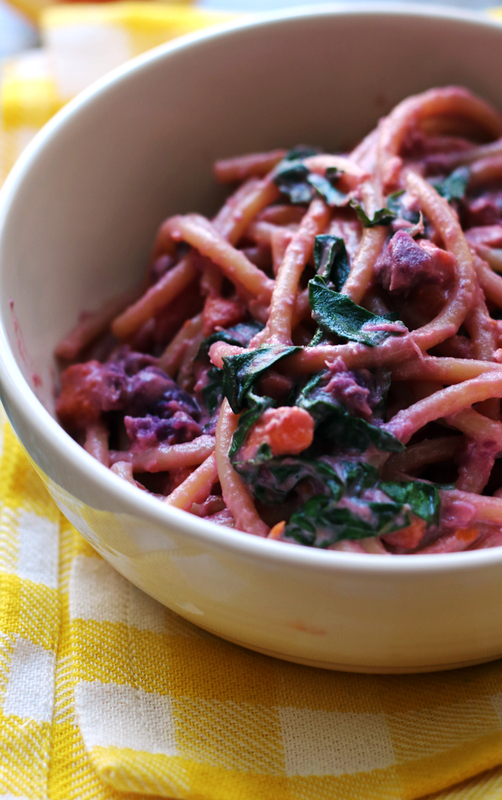 Add the cooked bucatini to the pan with the sweet potatoes and chard. 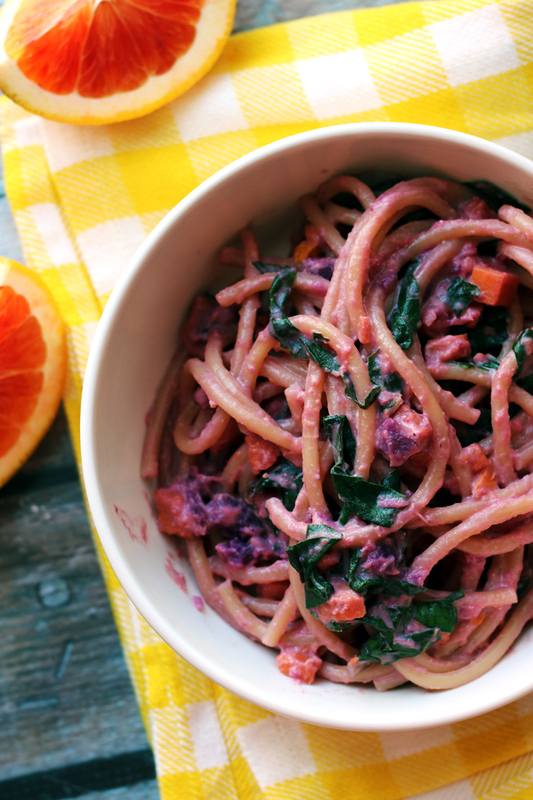 Pour the blood orange juice over the pasta and toss to combine. 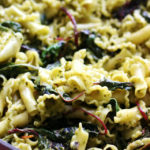 Crumble the goat cheese over the top ad toss again until goat cheese is melted and the pasta is evenly coated with it adding the reserved water a tablespoon at a time as necessary to create a sauce. Adjust seasonings to taste. Serve warm. This seems like something that would be really good cold too. No need to justify your carb on carb situations!! But also, I agree, sweet potatoes are too healthy to be considered a carb 🙂 I loveee the colors and flavor combos in this dish! !